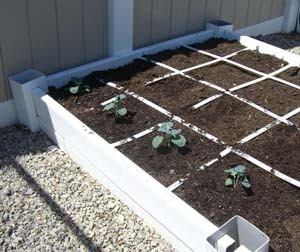 Before you even walk out the door, make sure your garden plan shows where each variety will be planted, and how many plants go in each square foot. Now, head out to your garden with your hands full and your hopes high! Work methodically so you don’t lose track of where you are. Pick a square. Use your pencil to poke the right number of holes (16 plants per square = 4×4, 9 plants per square = 3×3, 4 plants per square = 2×2). Then put 2-3 seeds in each hole. Gently cover them up and water. A note about planting the right number of seeds–if the seeds are small, you just need to pinch a few between your thumb and forefinger, drop them in, and call it good. I can never get just 3 carrot seeds. That’s okay, since you will thin (cut off the tops) of all but one plant per hole. Also, be expecially careful about watering small seeds–they will wash right away. In his book, Mel suggests pre-soaking the seeds, and even pre-sprouting them. I simply don’t have the patience for this. I plant directly in my garden, give it a good watering, and they turn out just fine! It is really important that you don’t just plop your newly-purchased or indoor-started plants into the garden. If they’ve been started indoors, they have never dealt with the intensity of direct sunlight. In fact, you’ll notice the leaves grown inside and later grown outside look different–the plant makes the leaves flatter and bigger indoors (to absorb more light) and then smaller and curlier outdoors. If you move them straight outside, they will get “sunburned” and die. Also, the stems are not used to the rigors of wind. Hopefully you have put a fan on them and touched them so they get strong to some resistance. Still, outdoors is a whole new world. One week before you want to plant outdoors, start taking your plants out to “visit.” Begin by putting them out for an hour or so, and keep them in full-shade. BEWARE: don’t forget about them–they will dry up and fry in the sun! Every day increase the amount of time they spend outside, and increase the amount of sun they get. This is called hardening them off. Once they are used to being outdoors, it’s best to plant them on a shady day, if possible. It really is worth checking the weather reports and waiting a day or two. If you can’t wait, build a little something to protect them for the first day. Use your spade to dig a hole. Some plants do better if the level of the dirt in the pot matches the dirt in the garden (plant them just deep enough to cover the roots and dirt from the pot). Others do well if you plant them deeper (like tomatoes). Research each plant so you know ahead of time. Remove the plant from the pot. If the roots are all wound around and “root-bound”, use your scissors to cut off the bottom of the roots (dirt and all) before placing it in the soil. 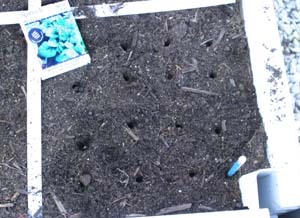 Fill the remaining hole with your Mel’s Mix soil. Water–just a cup of water per plant is enough. I suggested bringing a bucket of water and a cup, because you’ll tend to over-water if using a watering can. The last thing I like do to when I plant either seeds or plants is to update my garden plan with the date I planted them. That way my plan becomes my journal–a way to keep track of when I did what. This is really helpful when 2 weeks later, a square is still empty. You can check the seed packet to see when it should have germinated. Then, either wait patiently or replant. For example, if seeds should sprout within 7 days and it’s been 14, I would replant. But sometimes it takes a full 14 days or more to germinate, so I would wait it out. Early in the spring I get so anxious and time seems to go so slowly. It’s nice to have a written record to go back to. Starting Seeds Indoors–Is it worth it? fertilizer, since it helps root development. Also, there’s an eggshell trick I learned you can read here. Finally, even though you are Yellow–have the temperatures in your area gotten colder than 55 at night? Tomatoes don’t do well with even cool temps, so you might consider using Walls O Water or something like that. I am in the yellow group (Nashville). My tomato plants aren’t growing very fast. They were given to me by someone else. They were indoors, at my house, for about 2-3 weeks and then I planted them in my raised bed/square-foot garden bed. (1 per square) They’ve been in there for about a month (today is 5/10). Any ideas/suggestions? Plants new ones? They still have green (shrively, mind you) leaves, but they just haven’t grown any. If they are new seeds, it’s very likely most will germinate (90%). With beans and peas, I’ve taken to planting only one seed, and replanting if that spot is empty when the others show up. Oops, wish I would have seen this post before I planted. I just planted today and only planted 1 seed per hole, except my carrots because like you mentioned it was hard to get just 1. Do you think I should do anything at this point, or just wait and see what I get? Do you even plant more than one seed for the seeds that are really big, for instance the lima bean seeds were huge. As for the squares, I used plastic knives and twine to mark my squares. I bought my dividers at homegardenstogo.com, but you can make them from strips of wood, mini blinds, etc. If my garden beds were wood I would use nails/screws and kite string. 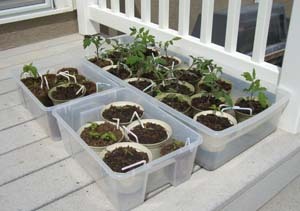 I bought plastic dividers from homegardenstogo.com. You can make them from old mini-blinds, wood, etc. In ways I wish I had wooden boxes so I could just use nails and kite string. What do you use as the dividers for your squares? Thanks for all the great info. Jennifer–I don’t know your color group, so it’s hard for me to tell you what’s too late. Did you sign up for my newsletter? You will get emails listing all the plants to be starting from seeds, transplanted, and planted outside from seed. I was excited to find your website. 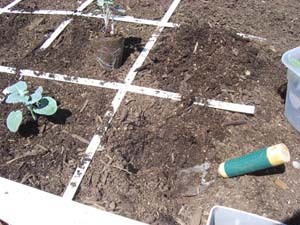 I am hoping I am not in over my head – doing a square foot garden for my first garden. I live in Angola, IN. I am starting with all seeds. I dont have any transplants. I have peppers, cucumbers, tomatoes, carrots, peas, cauliflower, lettuce and squash. Am I starting too late with any of these as seeds? I noticed the above comment about the tomatoes. What about the rest? It says my spring planting season is in May, what if I get started now? Thanks for your help! 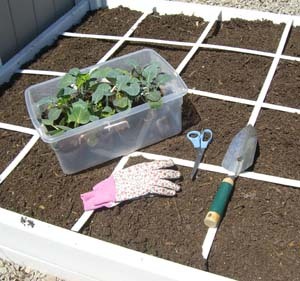 Michelle–you can plant seeds outside if you have an extremely long (or year round) growing season. Most of us don’t have enough time to grow tomatoes from seed. So, we’re stuck starting them indoors or buying transplants. 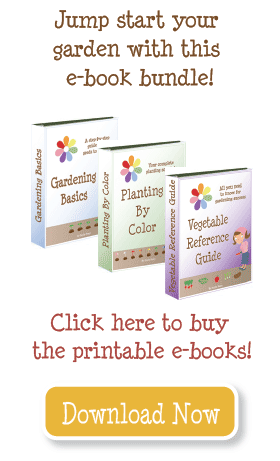 I am planning my first sq ft garden and am loving your website! There is so much information and I so excited to get started. I bought seeds today and am wondering specifically if I HAVE to start my tomatoes and bell peppers inside. Is it not possible to plant them now outside as seed since I’m past my last frost date? I’m new to this and would love advice 😀 Thanks! I am so excited to have discovered your site! Thank you so much for sharing all this wonderful information! I have always wanted to start a garden, but was unsure of how to begin. Now, thanks to you, I have high hopes of getting a nice garden started this year!